With the hottest summer most of us can remember this year, it would come as little surprise to hear that we have been receiving a high number of enquiries about domestic air conditioning installations. There is something about crazy weather or climate change in the news every week which has got a lot of people thinking about adapting to a new way of life as temperatures change. As we move into the cooler winter months, it is a good time to take stock of budgets and plan for home renovations and many are considering domestic air conditioning as their project for next year. We have put together a list of the most frequently asked questions that we get to help you decide whether or not it is right for your home too. At the simplest level, an air conditioning system will remove warm air by expelling it outside and replace it with cooled air. This cooler air has been drawn from outside and cooled as it moves through the system. It works in a similar way to your heating, but instead of water uses a refrigerant gas. Can I only cool one or a few rooms? Yes, you can install individual units in rooms, it isn’t necessary to cover the whole house. If you are on a tight budget, consider those rooms that you use most often, such as the bedroom or living room as the place to start. This will depend on the number of units you want installed and the space that you need to cool. 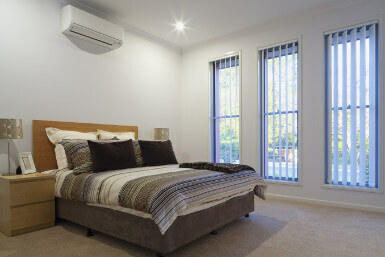 You can get a more accurate quote from your installer once you know how many rooms you want to have air conditioned. Will you need to drill holes in the wall? There will be a need for a small hole in the wall for each air conditioning unit. This will fit the pipe that removes hot air from your room. It is done discretely though and should you remove the unit at any time in the future it can be easily repaired. Air conditioning units do require maintenance. However, for domestic units, two services per year is usually sufficient. The maintenance check will clean and inspect the filters, then advise if they need replacing. Clogged filters will lead to an inefficient system, causing hot spots around your room and higher energy bills as the unit struggles to cope with blockages. Filter obstructions can, in extreme cases, lead to dirt particles in the air being transferred into the evaporator coil which could slow it down or damage it. Some filters can be cleaned and reused while others must be replaced. If you live in an area that experiences dusty conditions or if you have pets at home, your units may need servicing more frequently.